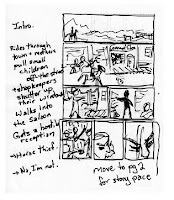 Okay, here's a bit of what went through my mind when I was planning the page that I posted last week. The class assignment was based on the old joke "a horse walks into a bar, and the bartender says "why the long face?" 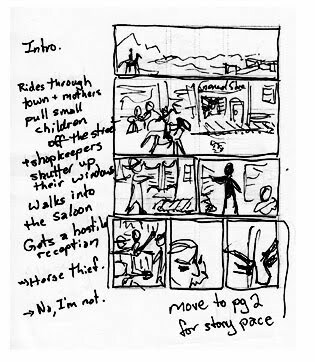 The assignment was to draft up a page thumbnail with the basic storyline "A (character) walks into (an environment) and says (a line) to (a second character)". 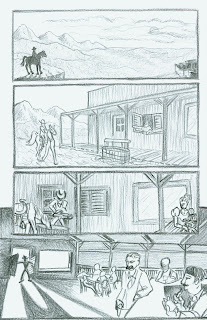 And because after hearing the horse joke, it was the next thing that came to mind, I decided to do a cowboy story where a cowboy walks into a saloon and says something like "you gotta lotta nerve coming back into this town." 1. Started out with the first story beat and realized I'd rather keep all of the panels until the first close-up in widescreen format, to give it more of a Western movie feel. 2. I made the establishing shot bigger to provide more information about the setting. The instructor suggested I try using an over-the-shoulder shot. I gave that a go, and roughed in the story beats up until the character delivers the line. 3. 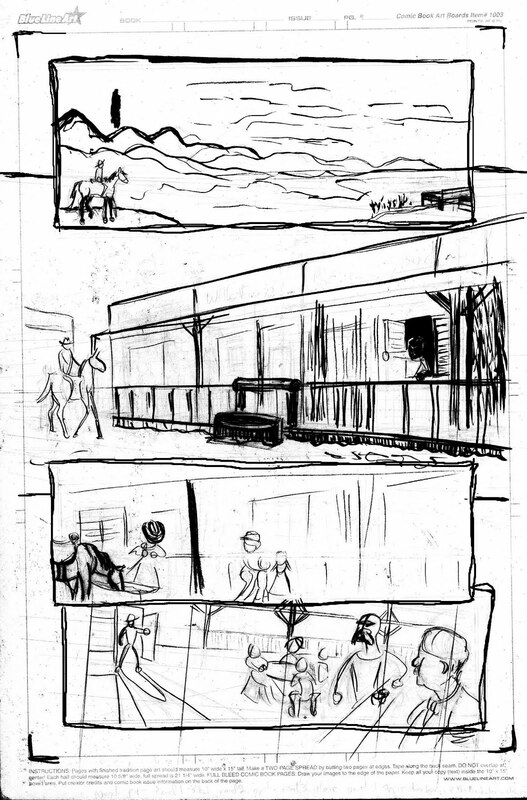 I decided to keep the establishing shot long and narrow, and the main character small in the panel to emphasize his isolation from the town and its folk, and I flipped the eyeline in the last panel to give the reader an exit from this page to the next. 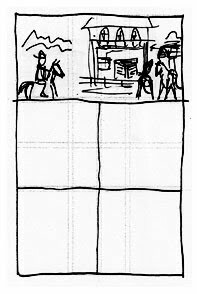 The instructor suggested I move the last three panels to page two because the pace felt a little rushed trying to get it all done in one page, and really the point of page one is the dramatic tension of the main character riding into town and entering the saloon. 4. 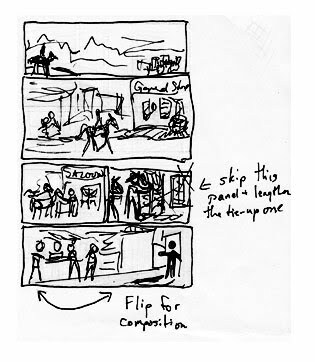 Revised to include just up to the point where the cowboy walks into the saloon. 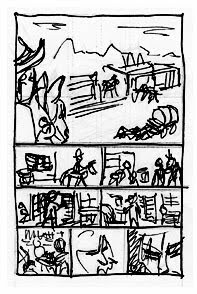 Except that for narrative flow, the last panel should be flipped so the cowboy is walking into the panel on the left-hand side, so he enters the same way we'd read it, and the dramatic tension on the right hand side causes a pause in the forward momentum. 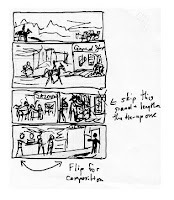 Now, because the first spoken line has been moved to page 2, and I was OK with the basic narrative flow in the thumbnail, I went ahead and went straight to full 11x17 format without doing the 5x8 layout sketch I would do for plotting dialogue bubbles and camera angles. This resulted in a godawful eggregious layout error. - there is a railing running exactly through the horizontal centre of the page. It's basically the visual equivalent of clotheslining the reader. Yeah, go ahead and look. I would apologize in advance for what you're about to see, but I warned you. So, lesson learned. Check your layouts early and often. Righty-o. The other narrative tweak was that I decided that the information in panel 2 is not as important as the information in panel 4, so I switched out which was the big full-bleed panel and which would be kept in the inside margins of the page. And I still haven't made a decision on the final renders, but I'm leaning towards more stylized than realistic. There's a big monsterfest coming up, and my style, and the nature of the story itself where the characters are aware of the fact that they are in a comic book, leans more toward cartoon violence than actual gore. It may seem weird, but I took vacation time to go to school full-time. In particular, to attend the summer session of Graphic Storytelling and Digital Rendering workshops offered at Max the Mutt Animation School. 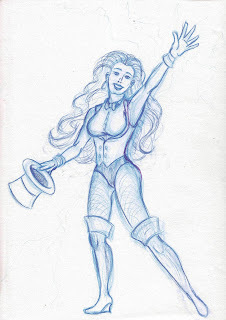 Of course, at the same time I was doing this, I was also taking a couple of night classes through Toronto Cartoonists Workshop so I had my hands full. Full of pencils. Awesome fun times. Sometimes frustrating and a little hand-cramp-inducing, but awesome fun times nonetheless. For the record, if you ever have the chance to spend sixteen straight days doing nothing but what you love best, TAKE IT. For all of its intensity, this was the most restful vacation I've ever had. At this point, I've got the kernel of a fun story to tell. So far, I haven't decided how I'm going to do the final renders, but here's the initial version. 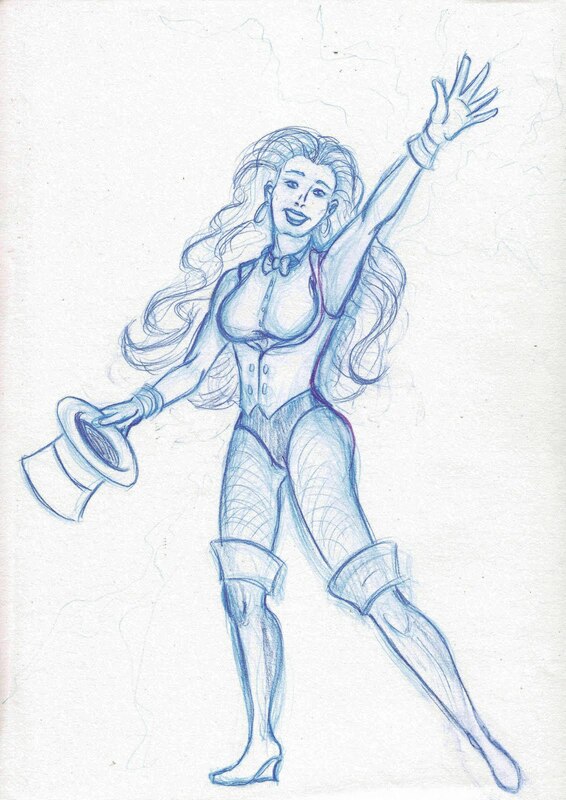 I haven't decided whether or not I like it the way it is, and I might redo this in regular pencil, instead of using grease pencil and going in with pen for the details (as shown). I'm going to think about it, and get back to you on that. 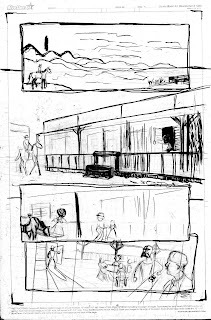 Coming up next week - the creative process behind the page. Okay, so here's some stuff. 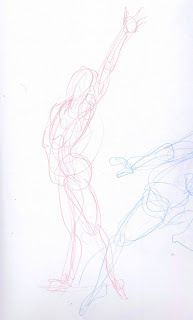 I was going through some old life drawings and found a kind of fun gesture drawing. 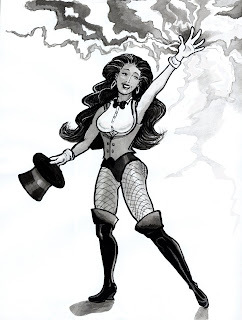 It's dramatic, it has some flair, and I said to myself "hey, that looks like a pose Zatanna would take." 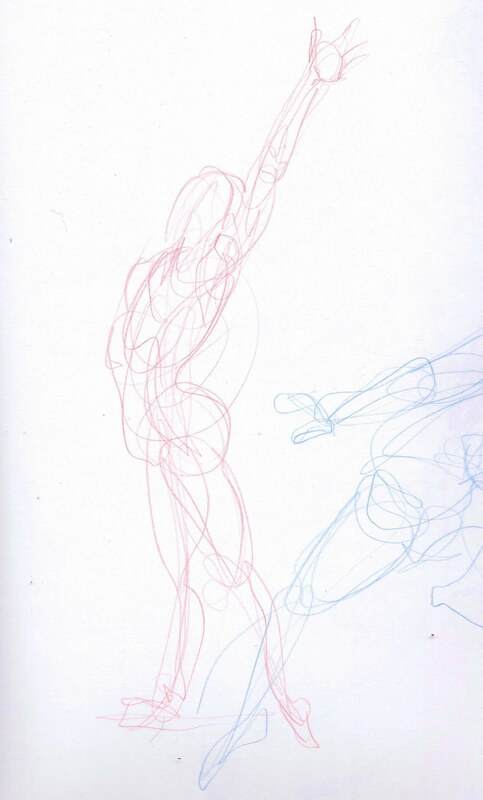 So, I worked it up as a rough sketch, which turned out okay. Once I had some decent line art, I put it on the lightbox and traced it onto some watercolour paper to do a rendering in ink wash.
Again, turned out okay. The wash did a couple of things I didn't expect, but that's what Photoshop is for, right?